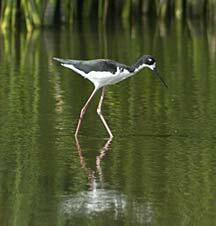 A Hawaiian stilt walks in water at the James Campbell National Wildlife Refuge in Kahuku. There aren't many places in the world where, within 15 minutes of getting out of a car, you can see four endangered birds. 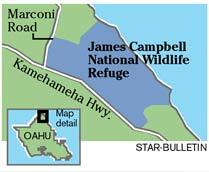 The James Campbell National Wildlife Refuge in Kahuku is one -- and each fall and winter, volunteer guides give free public tours. Connecticut resident Donna Hixon-Smith was the first visitor on yesterday's first tour of the season. A serious birder since she was a little girl, Hixon-Smith scored at least two additions to her "lifetime list" of birds she has seen: the bristle-thighed curlew, a bird that summers in Alaska but is rarely seen in the lower 48 states; and the tattler, another bird that often winters in Hawaii. "For me, birding enhances hiking and being outdoors," she said. "I like to be doing something all the time." On yesterday's visit, Hixon-Smith was able to see all four of the endangered water birds for which the Campbell Refuge is dedicated: the Hawaiian stilt, coot, moorhen and duck. 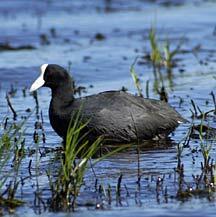 The Campbell Refuge was established in 1976 from the ponds of the old Kahuku Sugar operation. Conservation-minded people lobbied to keep water in the ponds so that the bird habitat wouldn't be lost, said National Weather Service meteorologist Pete Donaldson. 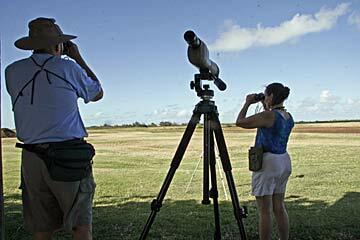 The refuge is makai of Kamehameha Highway, down an unassuming asphalt road and past the Kahuku sewage treatment plant. You can easily miss its wooden entrance sign in the profusion of roadside shrimp trailers in the area. Donaldson, who moved to Hawaii in 1979, said he enjoys leading tours in his spare time. "It's something I like to do, something I'd do anyway," Donaldson said of observing birds in the area. "So why not come out here and show other people? It's fun." Volunteer guides Abby Brown-Watson, a retired social worker, and her husband, Dave Watson, a retired University of Hawaii psychology professor, feel the same way. "About 90 percent of the wetlands on Oahu have been wiped out," Watson told Hixon-Smith as they set out with binoculars and spotting scopes to look at birds on a clear afternoon with little wind. Two of Oahu's biggest wetlands, Waikiki and Hawaii Kai, have been dried up for tourists and suburban housing, he noted. 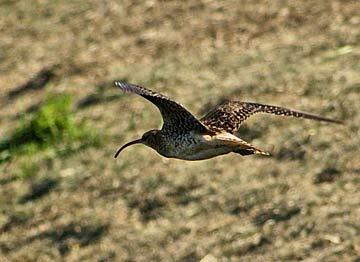 A bristle-thighed curlew (Numenius tahitiensis) is one of the migratory birds that is visiting the refuge. 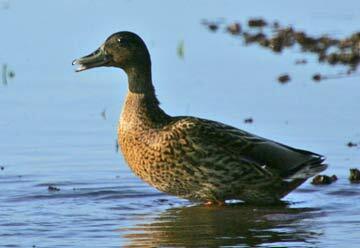 The Hawaiian duck, koloa maoli, above, is difficult to identify due to interbreeding with the northern mallard. Genetic testing is the only sure way. Volunteer guide David Watson and birder Donna Hixon-Smith looked for rare and common marsh birds at the James Campbell National Wildlife Refuge yesterday. 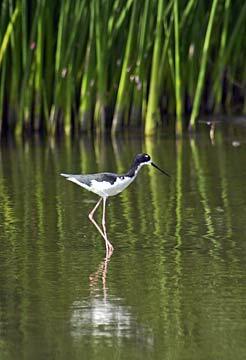 About 100 Hawaiian stilts, 150 Hawaiian coots, 50 Hawaiian moorhens and an undetermined number of Hawaiian ducks call the Campbell Refuge home, Donaldson said. 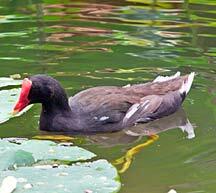 Each bird has its own characteristics, but all share a need for shallow-water ponds. Management of the refuge involves periodically draining and mowing the ponds to keep them from being overgrown and keeping bird predators at bay. 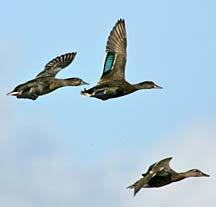 Guided tours are offered at the James Campbell National Wildlife Refuge on Thursdays and Saturdays through Feb. 18. Thursday tours begin at 4 p.m., and Saturday tours alternate between 9 a.m. and 3:30 p.m. starts. Tours take about an hour and a half. Reservations are required by calling the refuge office at 637-6330. For years the refuge existed on land leased from the Campbell Estate, but now the Fish & Wildlife Service owns or is in the process of buying 340 acres. The agency is negotiating to acquire up to 1,100 acres over the next few years, said Oahu refuge manager Sylvia Pelizza. The chief advantage of expanding the refuge would be the likelihood it could then accommodate more endangered birds. Expansion plans aren't without controversy, however, since a number of aquaculture farms operate on the leased Campbell Estate land under consideration. "I'd like to see aquaculture co-exist with the refuge," said John Corbin, program manager for the state aquaculture development program. It's only in the past five years that the public has been able to go on the refuge and see the birds. "Anytime we can let the American public enjoy wildlife refuges without impacting the wildlife themselves, it's a good thing," said Barbara Maxfield, Fish & Wildlife public information officer for Hawaii. "The more people know about these species, the more they are interested in protecting them." Food: Worms, crabs and fish in shallow water. Numbers: 1,200 to 1,600. About 70 percent are found on Maui and Oahu. Food: Algae, aquatic insects, mollusks and snails.